Exterior shutters are an effective way to boost the appeal of your house; not only will it instantly become more inviting and pleasing to the eye, but the property will also gain enduring window treatments capable of sheltering your glass surfaces from bad weather for many years to come. Their structure is a fixed one, being composed of slats, panels or boards. Nowadays, they are available in many styles and manufacturers provide a huge range of options in terms of colors and finishes; modern materials such as composites or aluminum add extra durability and provide eco-friendly alternatives to classic wooden shutters. All you need to do is to get accustomed with the possibilities that lie in front of you and pick the right products to match the façade of your home. 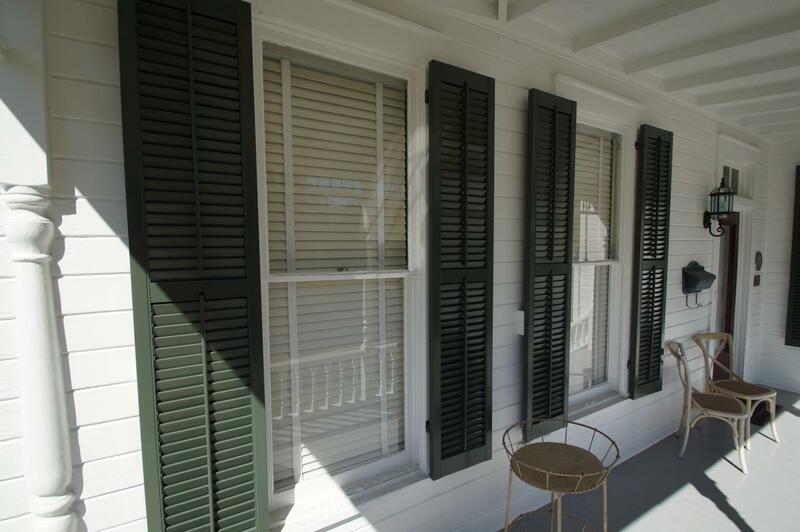 A very popular exterior shutter style is the louvered one. It features a classic look with horizontal slats angled towards the exterior, that filter natural light while keeping the dwelling ventilated. With hinges that are mounted on the sides of the window, these treatments also outswing in a neat way. Their timeless silhouette gives a relaxed, colonial vibe and is available in both decorative and operable varieties. The former has fixed louvers that are usually inclined at a 60-degree angle in order to let the air circulate while darkening the room when the coverings are shut; the downside would be that the light control is minimum, which makes this sort of window treatment more suitable for warm and dry climates, where keeping a constant cool temperature inside is a must. The latter includes a tilt rod that runs through the middle of the louvers that enables the slats to vary their position according to your needs. This style is especially efficient for properties located in areas with changeable weather, because it allows the shutters to become completely closed during rain, snow storms or fiery summer days, or to open and let day light in. Either way, louvered exterior shutters will surely impart a chic Mediterranean look to the front of your house. Having a laid-back tropical feel, Bahama shutters are great to use in order to enhance the architecture of beach houses. They also shade house interiors from the scorching sun, while allowing great visibility and privacy for the occupants. Unlike traditional louvered shutters, this variety comes hinged at the top edge and basically tilts away from the window with the help of levered arms. One common feature however is the slat-design that can also be functional or ornamental. For wider windows, decorative or operable tilt rods are available, thus offering enhanced stability to the coverings. Exterior Bahama shutters are also known under the name of Bermuda shutters, and are very popular with tropical island dwellings due to the excellent protection they provide against strong winds. In order to tolerate extreme storms, this type of shutter has to be made of tried-and-tested aluminum with reinforced positioning systems. Raised-panel exterior shutters give a warm, cozy look to any home thanks to their artisan-crafted appearance and three-dimensional design. The sculpted segments capture and reflect light, creating elegant beauty that will surely complement historical architecture and country cottages. Set against classic brick walls or a crisp façade, this style of shutter will instantly increase the aesthetics of the property. Mounted on the window frame with metallic hinges, the coverings will open to the sides, being also capable of balancing undersized or narrow windows. Flat-panel exterior shutters feature a minimalist design with clean lines and a simple structure. That is why they will complement traditional houses with an unsophisticated architecture. These coverings also lend themselves to DIY-shutter projects for passionate craftsmen, due to their basic configuration. 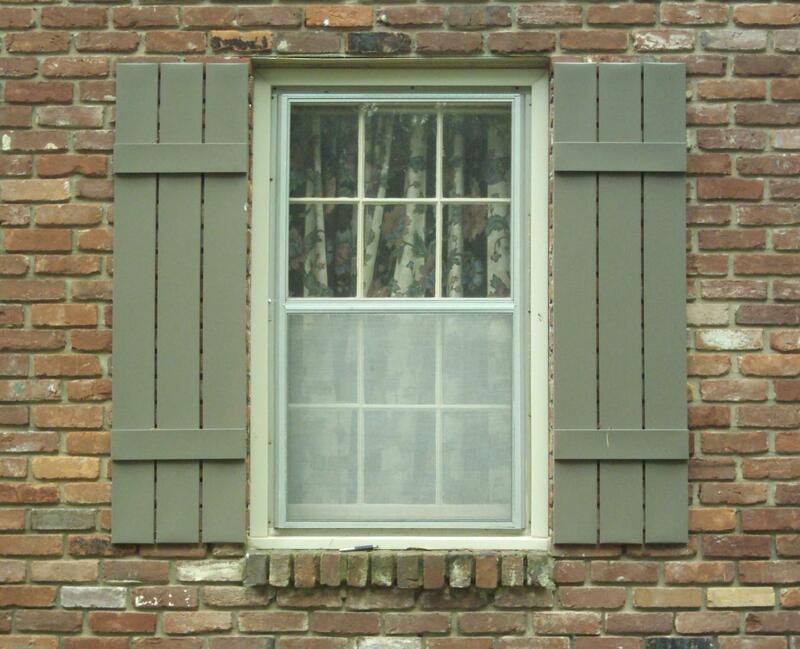 The outline of these shutters can include a single panel, which works for smaller windows, or two panels separated by a divider - a great solution for tall windows. Board-and-batten shutters definitely have a place of their own in the rustic arena. Their fairytale appearance can transform any house into a comfy pleasant-looking residence. The way they are made is very simple: a few wood panels are positioned vertically next to each other while being held together by horizontal battens. Modern alternatives are available in vinyl or composite materials, too; however, the original structure was made from natural rough wooden pieces and is characteristic to West and Central European rural architecture - many cottages in the French or Austrian Alps feature this shutter style. 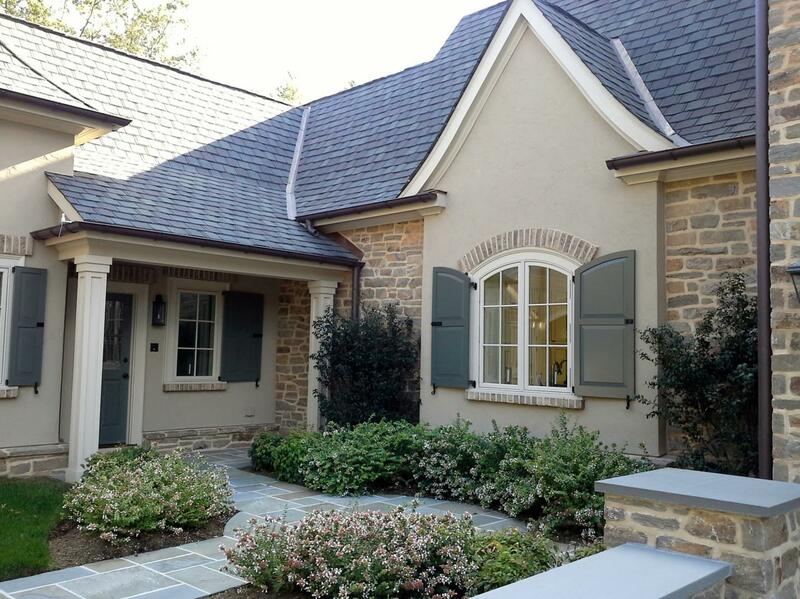 So in case you are thinking about dressing the exterior of your windows with board-and-batten coverings, you can choose from two styles: open and closed. Closed board-and-batten shutters feature vertical panels mounted right next to each other and were initially used to protect the windows from storms, but also to offer complete privacy and a room-darkening effect. Open board-and-batten shutters have a more decorative rather than a functional role, as their boards are separated by narrow hollow spaces, therefore they do not provide perfect insulation. They look more rugged and rustic than their closed counterparts, being appropriate for rural houses situated in the mountains or picturesque regions. Natural essences enhance the appeal of shutters, regardless of their style, as the authentic wood grain looks elegant and effortless. Colored or stained, this organic material offers unbeatable charisma, easing the way buildings blend with their wild surroundings. When choosing natural wood exterior shutters, go for long-wearing kinds such as cedar, oak or cypress which will also emphasize the rural feel of your house with their alternating light and dark tones. 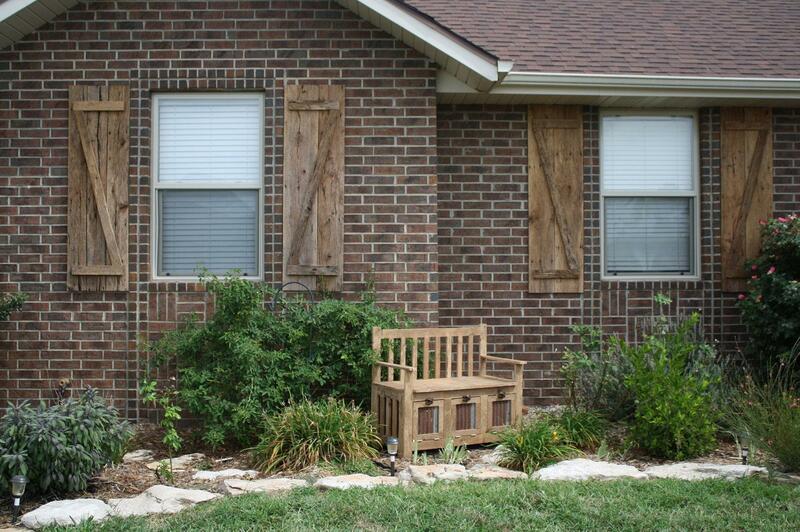 Reclaimed wood can also be successfully used for exterior window shutters, adding character and old-world charm. The term ‘vinyl’ has a broad meaning in the field of chemistry, referring to several thermoplastic chemical compounds that include materials such as PVC (polyvinyl chloride). 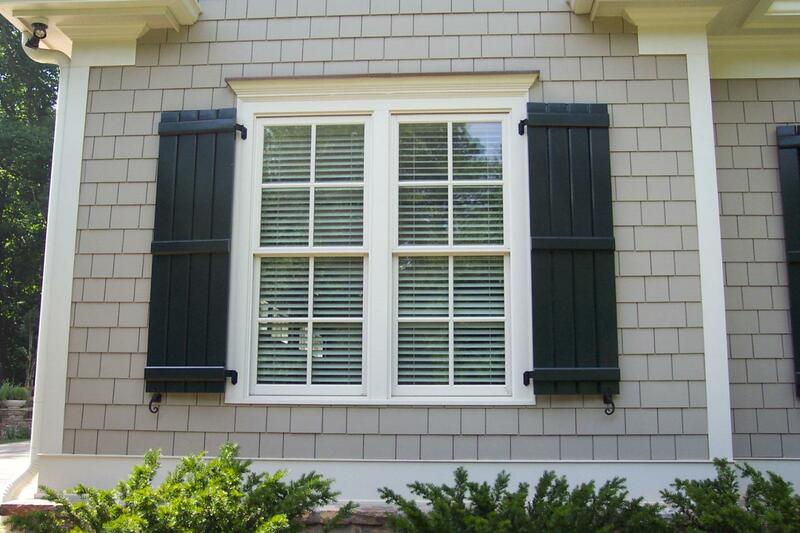 Vinyl is actually a strong, yet lightweight plastic that provides durability to exterior shutters. This material is also more affordable than wood and can endure drastic weather changes without fading or warping. A key element to have in mind when purchasing exterior window coverings made of vinyl is their aesthetics: recent technical developments have resulted in plastic exterior shutters that resemble natural wooden ones in texture, feel and color. In fact, vinyl window shutters should look as authentic as possible in order to improve the overall exterior appearance of a house; bland shutters that look too shiny or flat are to be avoided, otherwise, you will end up with a tacky look. 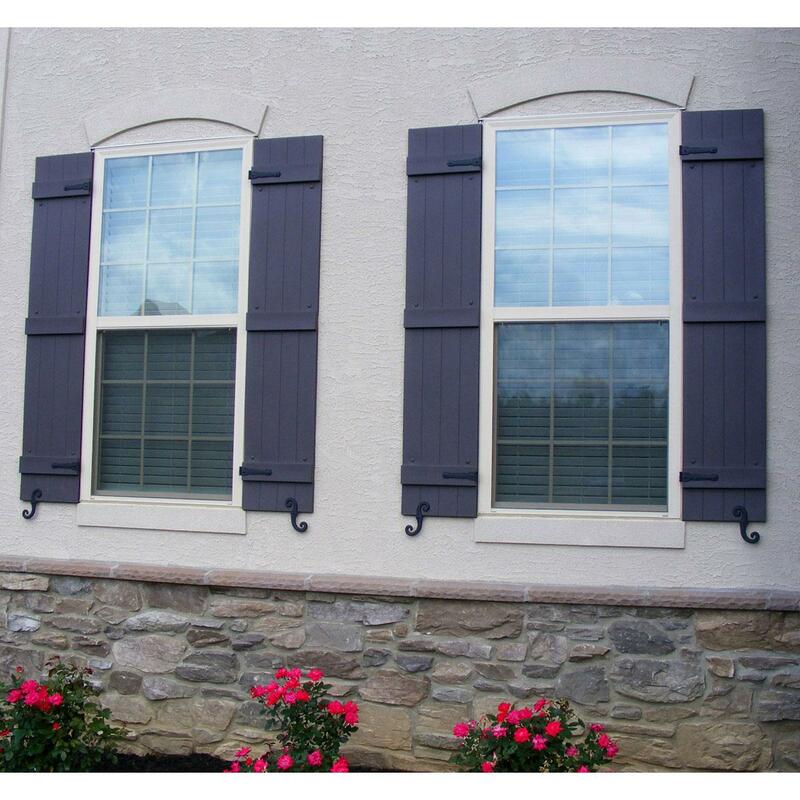 Also, often, vinyl exterior shutters are produced for decorative purposes only, therefore, it best to check with the manufacturer if the available products are functional or not. A great aspect regarding these exterior window fashions is that they come in all possible styles with a wide variety of colors, and, what’s more, they require minimal maintenance. 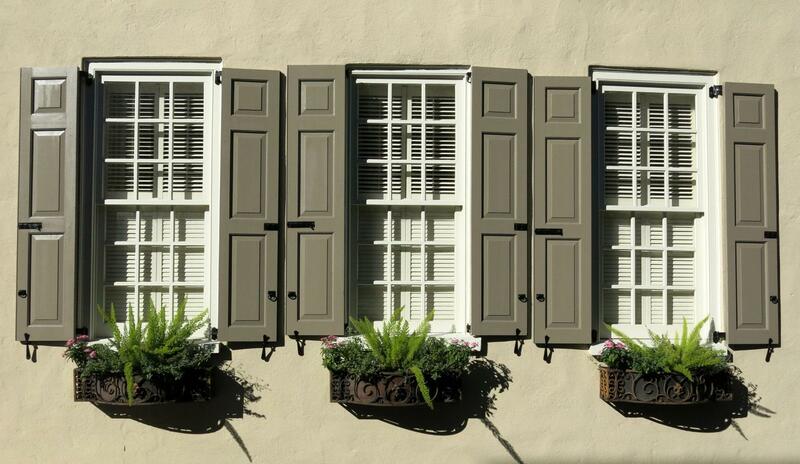 Aluminum is another durable and affordable material used in the manufacturing process of exterior shutters. It is widely used in the production of hurricane shutters as it offers great protection against flying fragments during strong winds. 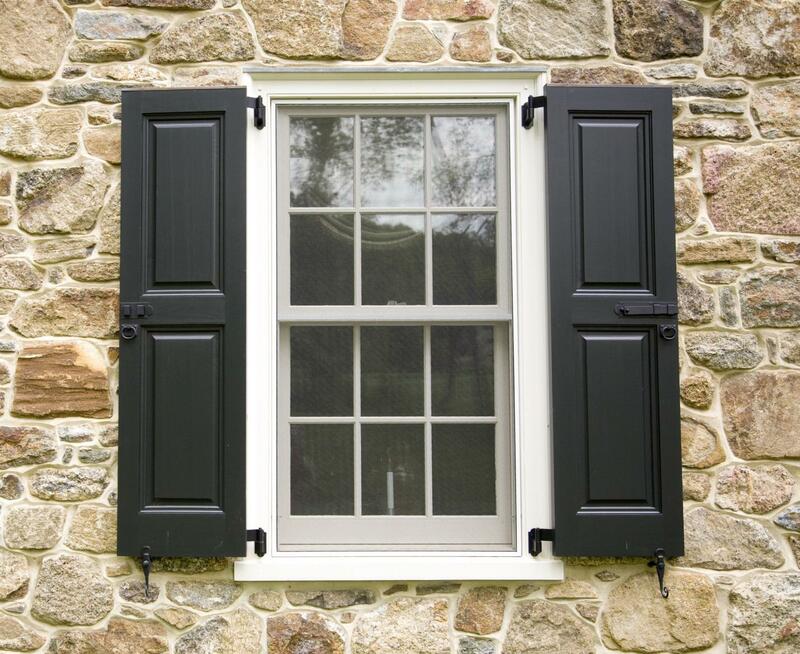 Like in the case of other synthetic exterior window shutters, significant care should be taken when it comes to their appearance; a matte or powdered finish will make them look much more stylish than a simple, smooth one, and will definitely preserve the historical aspect of a building, while lowering maintenance costs. Compared to natural ones, composite exterior shutters offer the same beauty and elegance, but with unsurpassed sturdiness. Their construction process includes the use of several materials, depending on the manufacturer: hardwood chips, fiberglass, PVC, aluminum-based components and other synthetic constituents. Composite shutters are produced using the same processes as wooden ones; therefore, they are available in all shutter styles, with a huge range of pigments to choose from. Their realistic appearance makes them perfect for historical districts, decreasing conservation expenses, because they are heat and moisture resistant, they do not rot, swell or crack, and are completely immune to termite attacks. 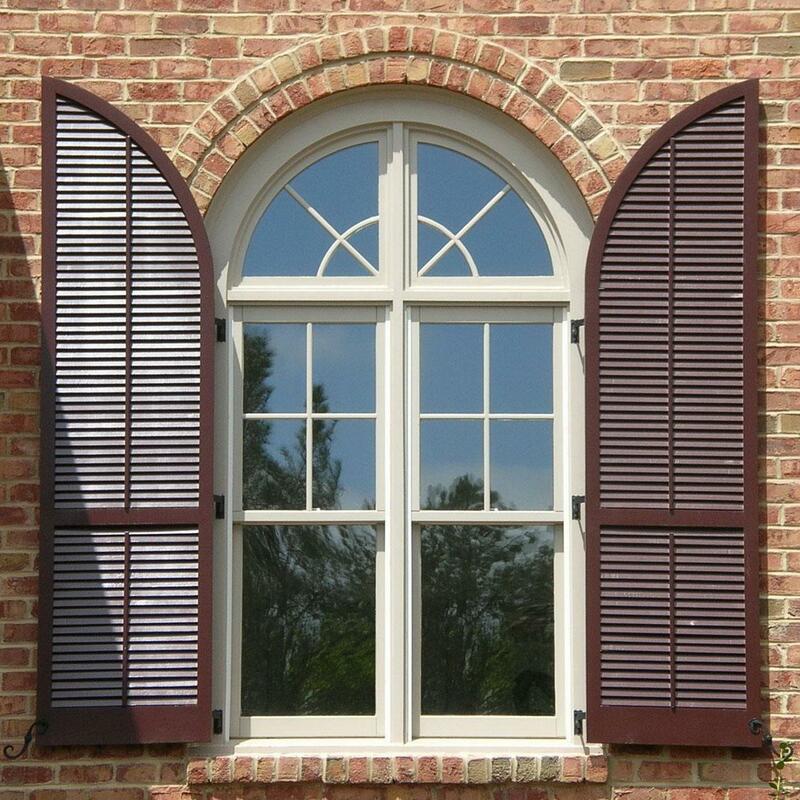 Arched windows should not be prevented from being accentuated with chic exterior shutters just because of their odd shape. In fact, these window treatments can certainly underline the elegant sweeps, increasing the curb appeal of your property. The only trick is to customize the shutter shape and size in order to gracefully respect the initial outline of the window. A wonderful way to personalize the appearance of your exterior shutters is to add custom cutouts; in this way you can achieve a one-of-a-kind design for your wood or composite coverings. There are many manufacturers who provide this feature for their products, so deciding on the perfect shape is the only thing you have to do. 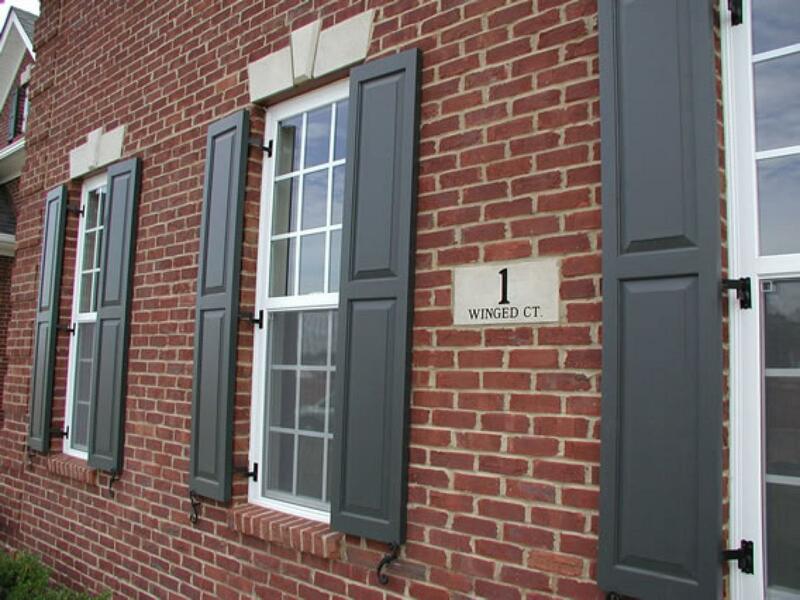 The accessories used for mounting and operating exterior shutters should enrich their aspect and preserve that vintage feel that you are after. The hinges and pins should have a weathered, raw look that complements the rustic charm of the coverings. In the same manner, you can add traditional elements such as ornate pulls and corner brackets; S-shaped or curled shutter stays add another level of refinement that can be even further enhanced with medieval-looking shutter bolts. There are numerous possibilities in choosing great fittings; however over-embellishing your exterior shutters is not something to be desired; by installing two or three decorative elements at most, you will obtain the perfect partnership between classic design and good looks. The force of nature can be truly humbling and anyone who lives in parts of the world frequently pounded by hurricanes knows that exterior shutters provide excellent storm protection when enhanced with special features. Such window coverings have to comply with the regulations set by the International Building Code and the International Residential Code, so that their composition and structure have to withstand constant wind pressure. Usually, they are made of extruded aluminum or polycarbonate, because they are light and hefty at the same time. 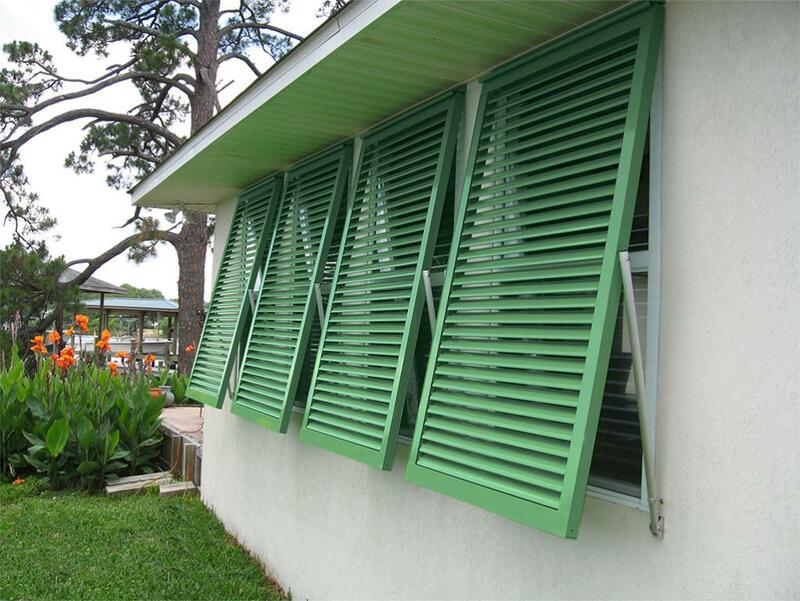 There are two main types of hurricane shutters: the first one is illustrated by accordion shutters which, as their name suggests, have a folding configuration. Actually, they are made of vertical blades that interconnect to create a flexible, yet durable compound. 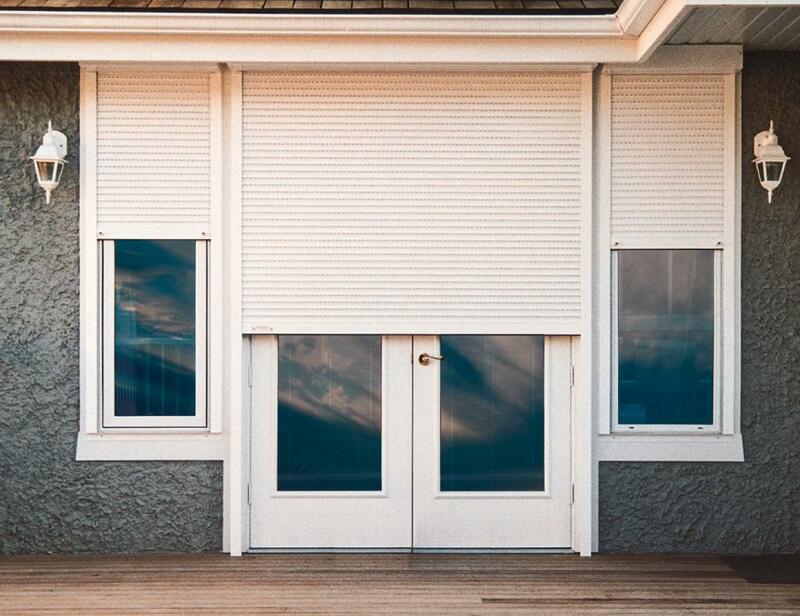 Accordion hurricane shutters can be easily stacked to the sides of the window when not used; however, during powerful storms, they glide on a rail system for a perfect coverage, being secured with equally resilient locks. In this way, the glass areas are protected not only from the cyclone, but also from dangerous flying debris that might break them. 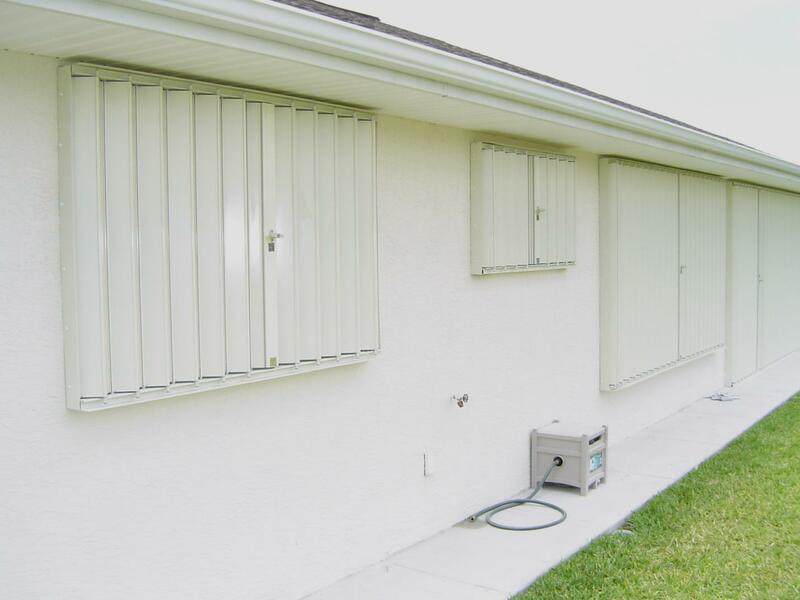 The second type refers to roll-down hurricane shutters (also known as roll-up hurricane shutters or rolling storm shutters). These coverings retract upwards when are open and slide downwards when are used to completely cover the windows of a building. Being made of horizontal blades whose height vary between 40 and 60mm, they can be operated manually, from inside the house, or can be motorized, for a state-of-the-art touch. 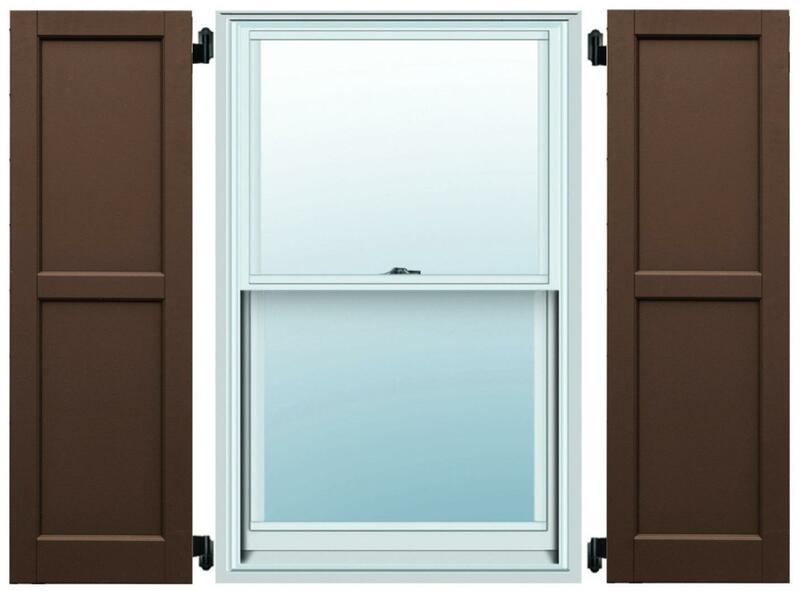 The interlocked slats roll on an axle which is mounted on the top edge of the window, also being disguised with a durable case. When dropped, the shutter is neatly guided by lateral rails, ensuring a tidy appearance. This type gets to be custom built for each window size and its appearance can be matched with the look of your window frames or other exterior décor elements. It is elegant and has a sleek European feel, as this system has been consistently used by Mediterranean nations to protect their windows from the elements. 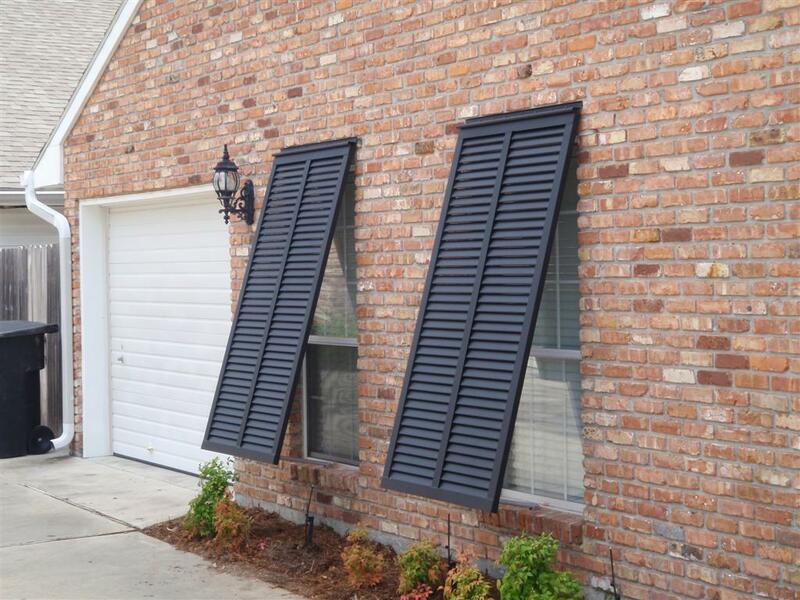 Besides their protection role throughout storms, these weatherproof shutters can also be used for insulation purposes during hot summers or cold winters. The air pockets formed between them and the windows impede heat transfer, thus keeping the indoor temperature constant and reducing your energy costs. They also provide noise reduction and protect your valuables from fading. To conclude, exterior shutters can surely augment the traditional architecture of a dwelling due to their elegant silhouettes and rustic accessories. Modern materials provide sustainable and durable coverings that combine beauty with safety, while offering you the possibility to lower maintenance and energy expenses.